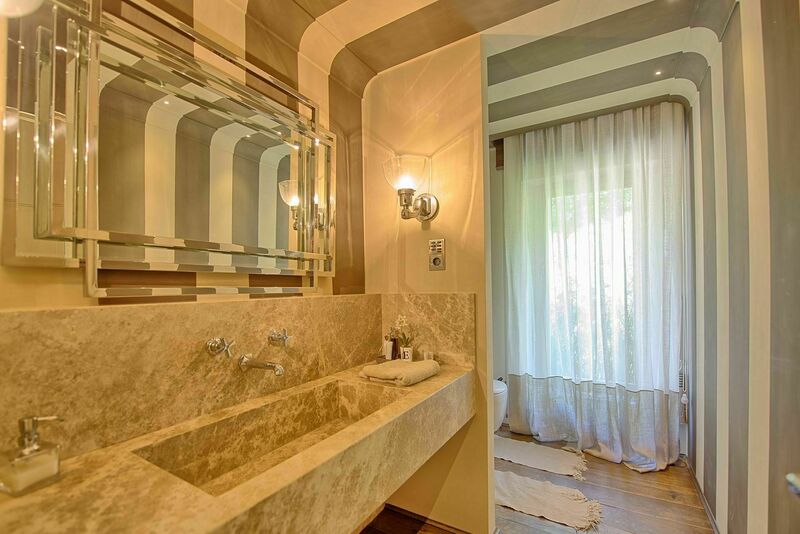 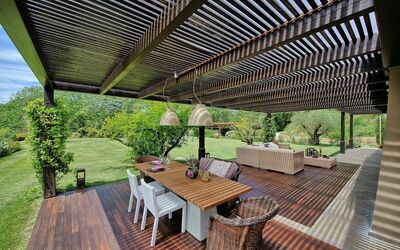 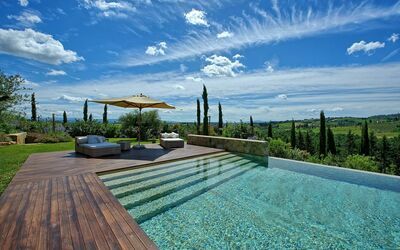 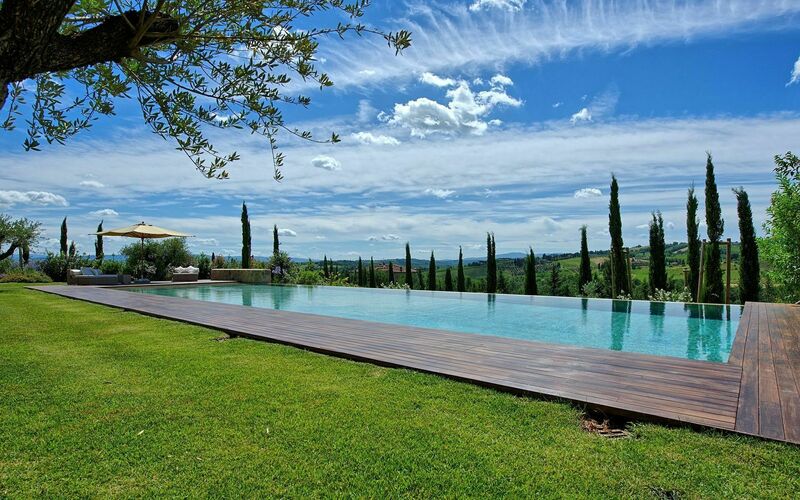 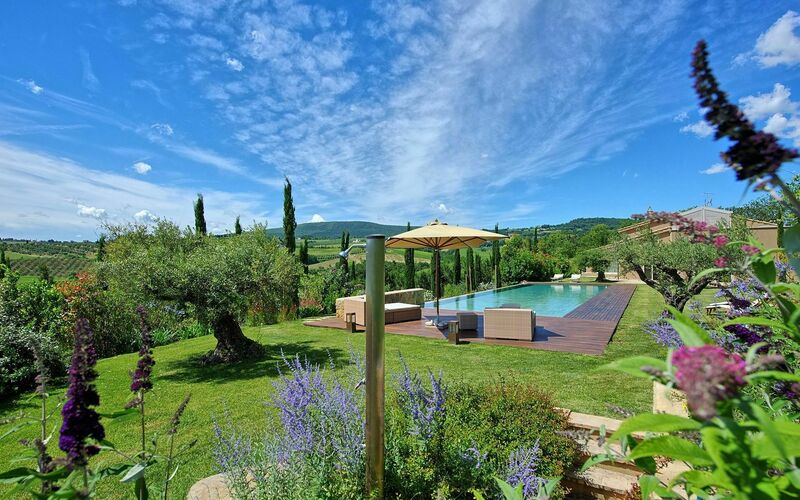 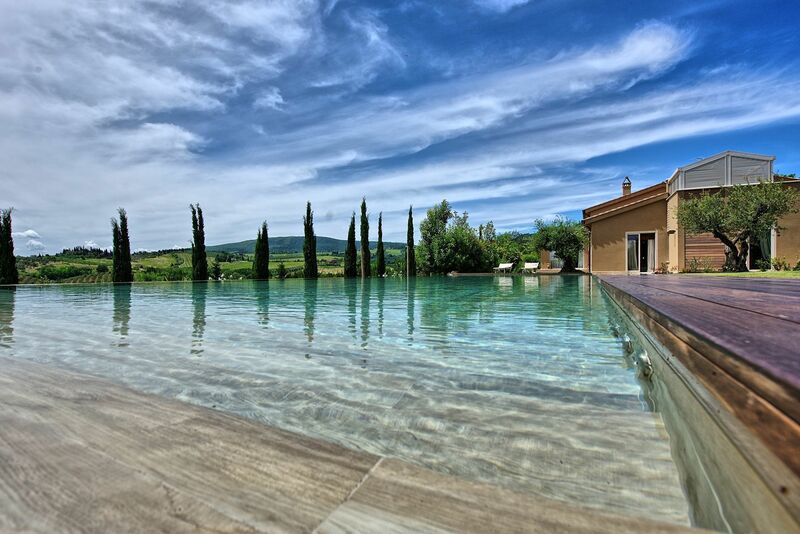 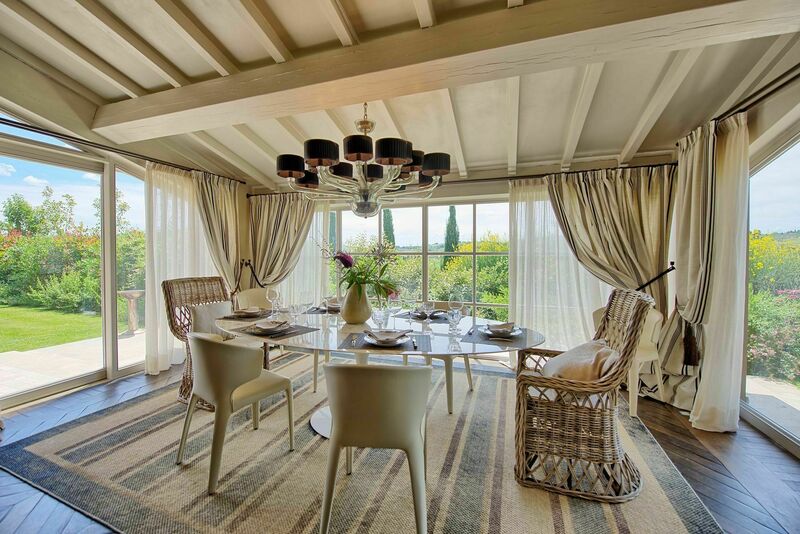 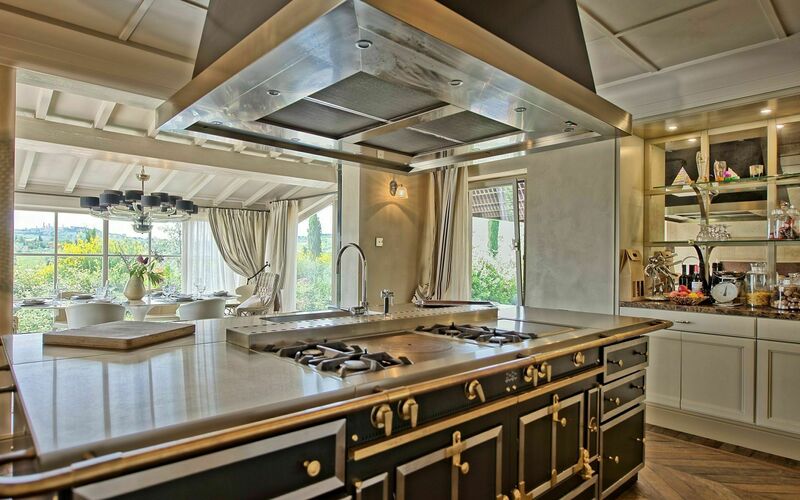 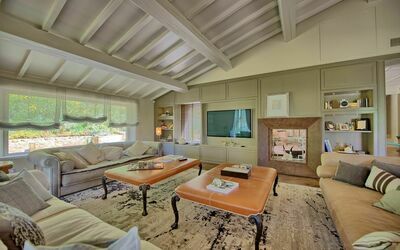 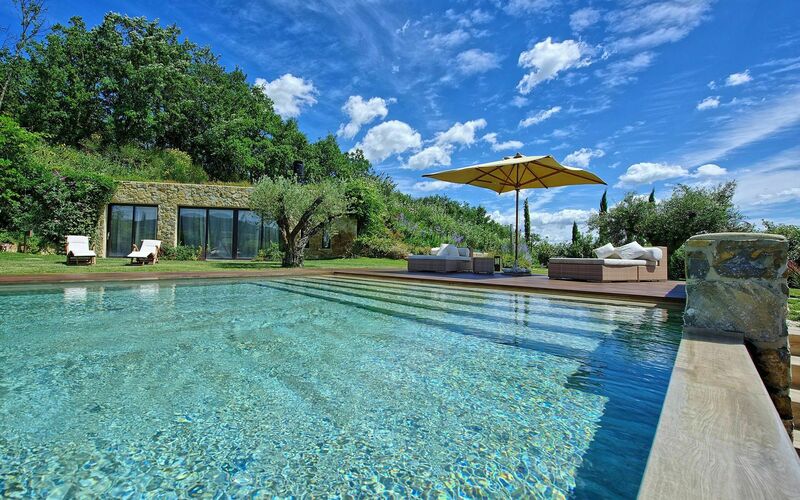 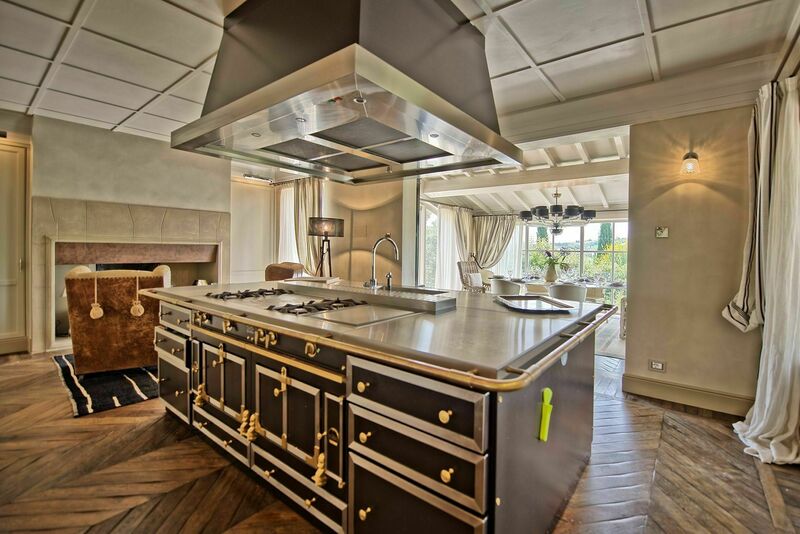 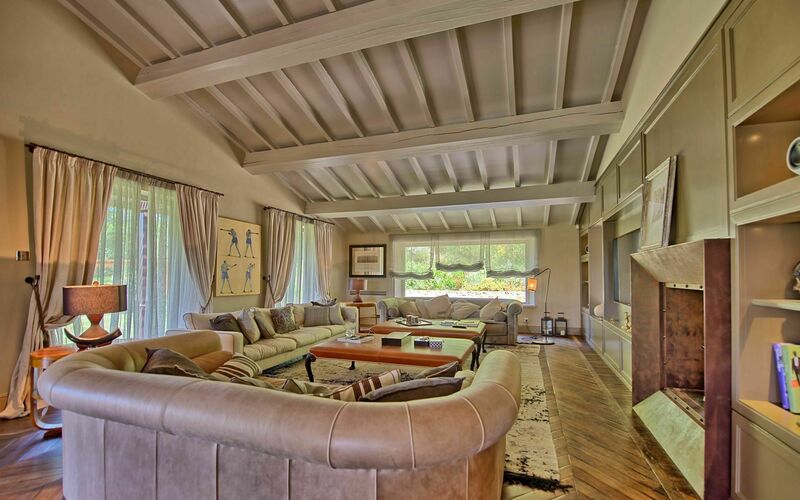 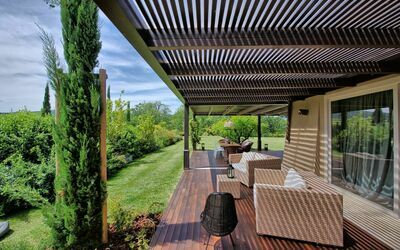 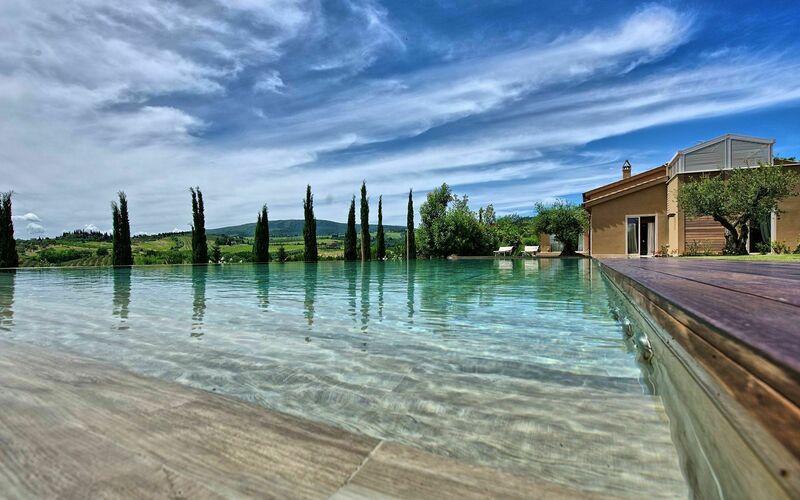 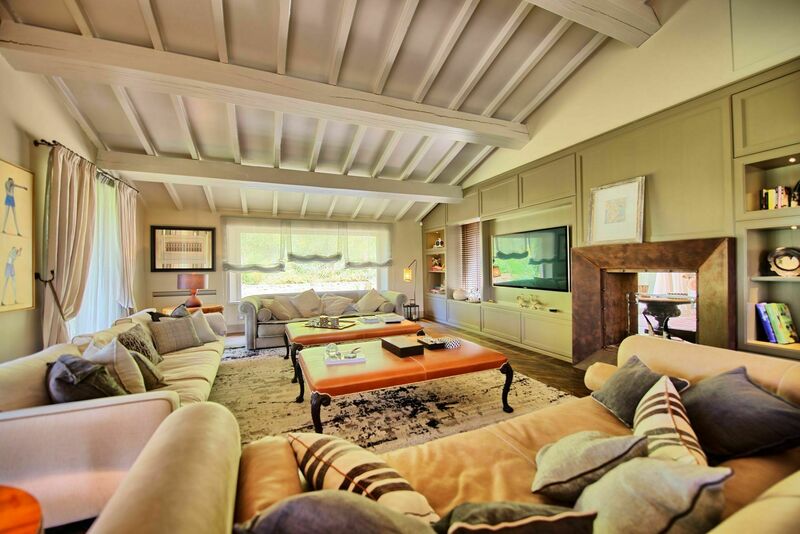 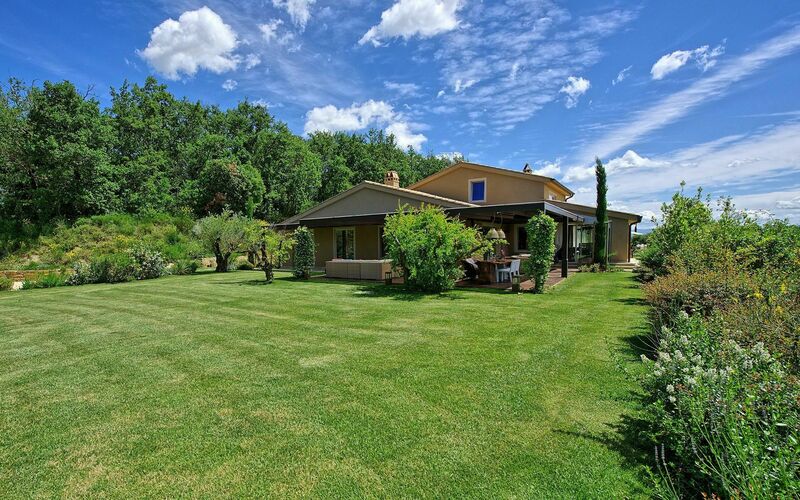 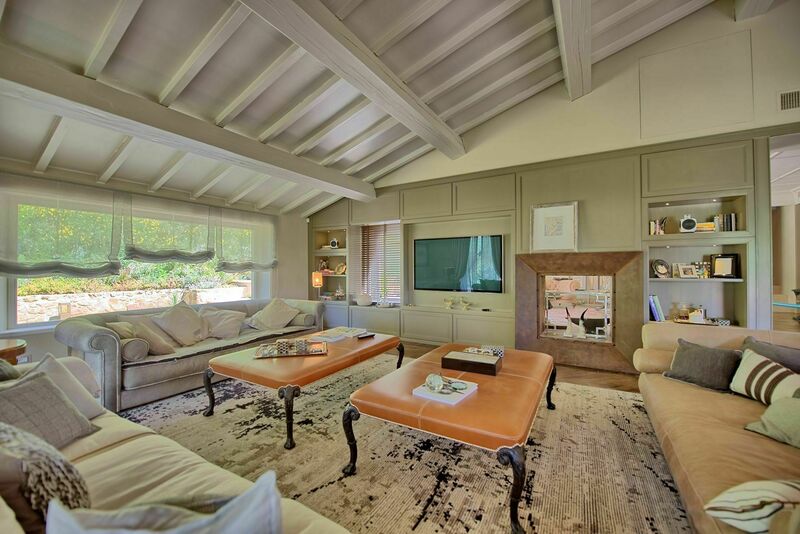 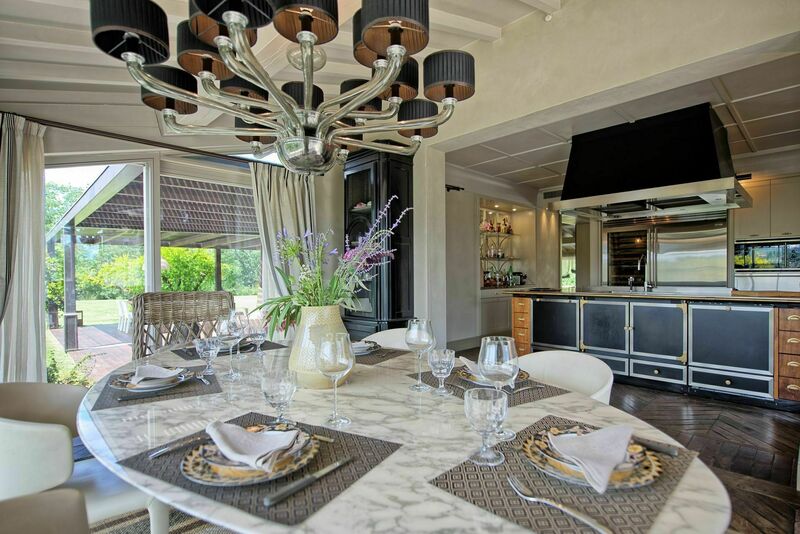 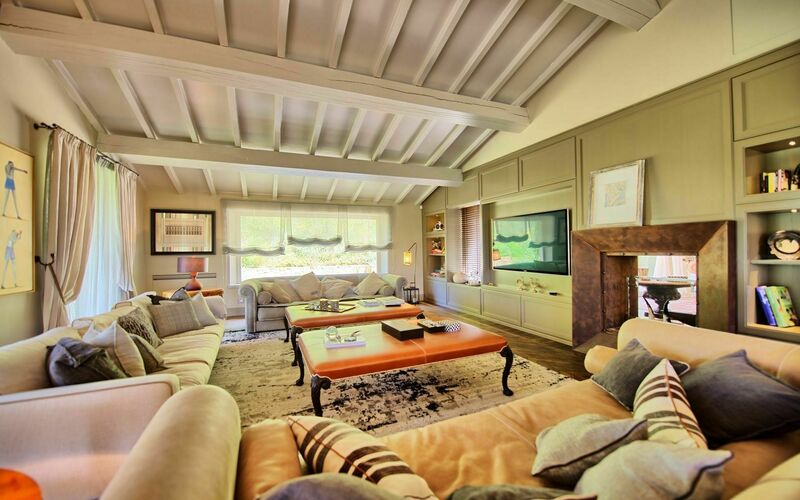 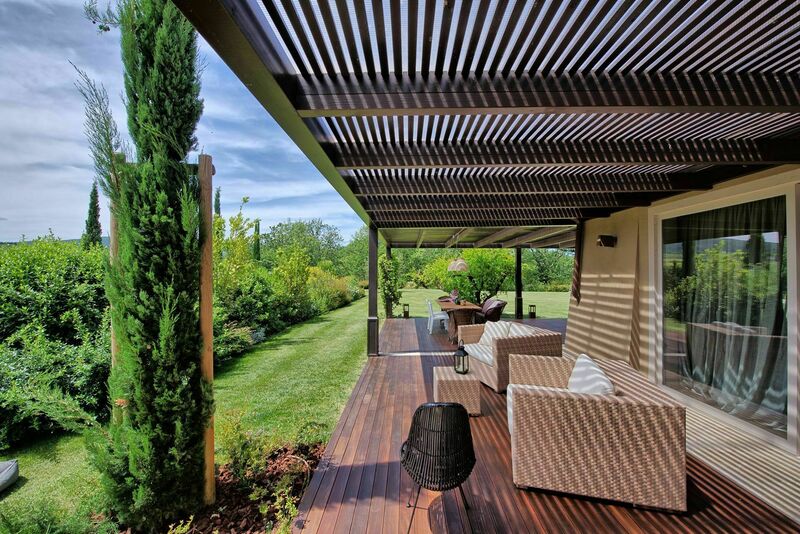 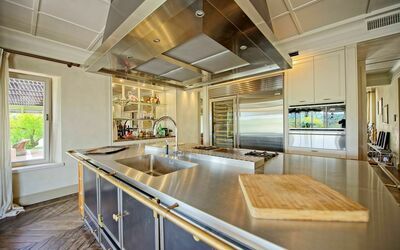 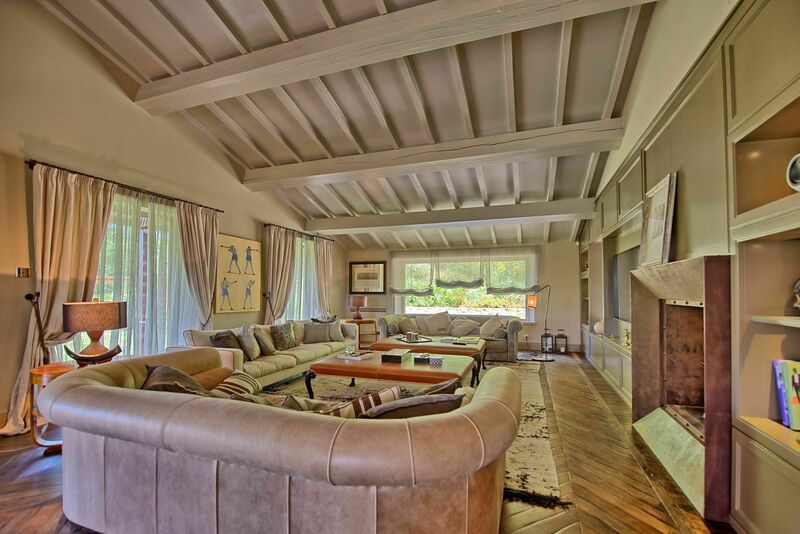 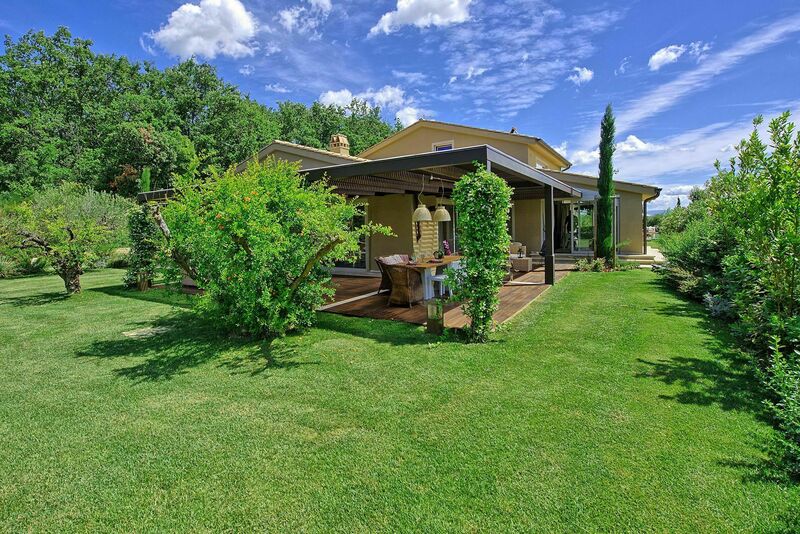 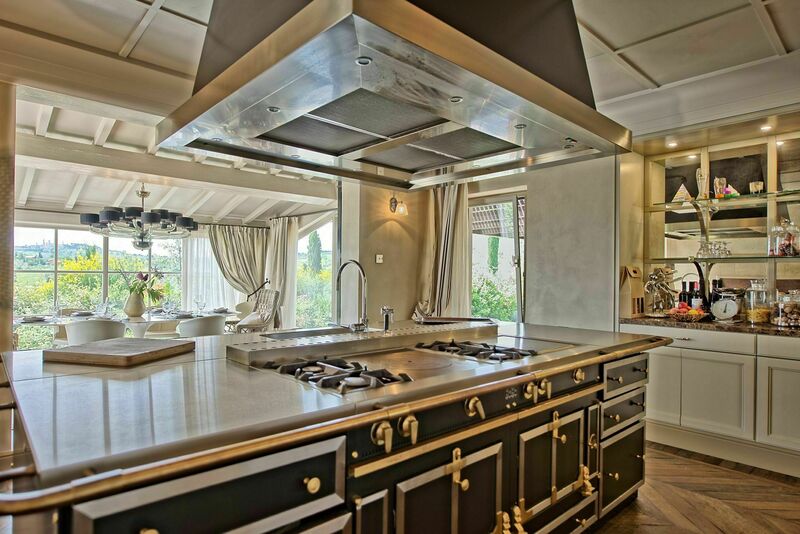 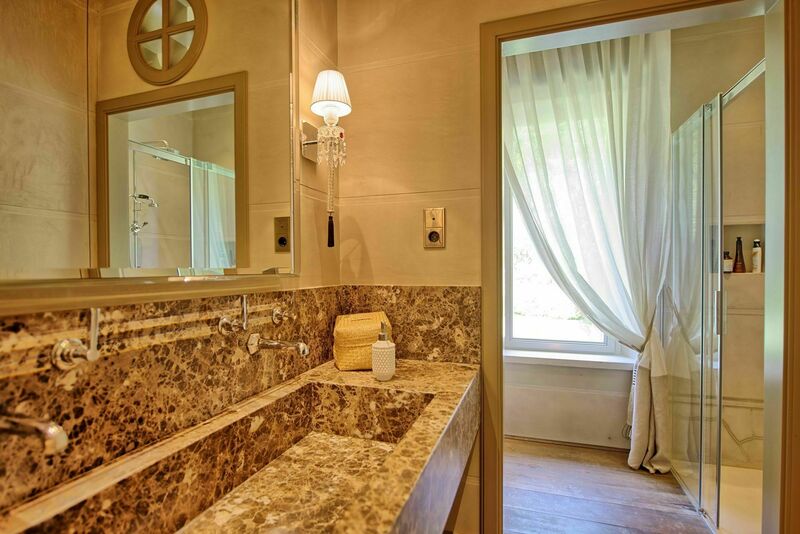 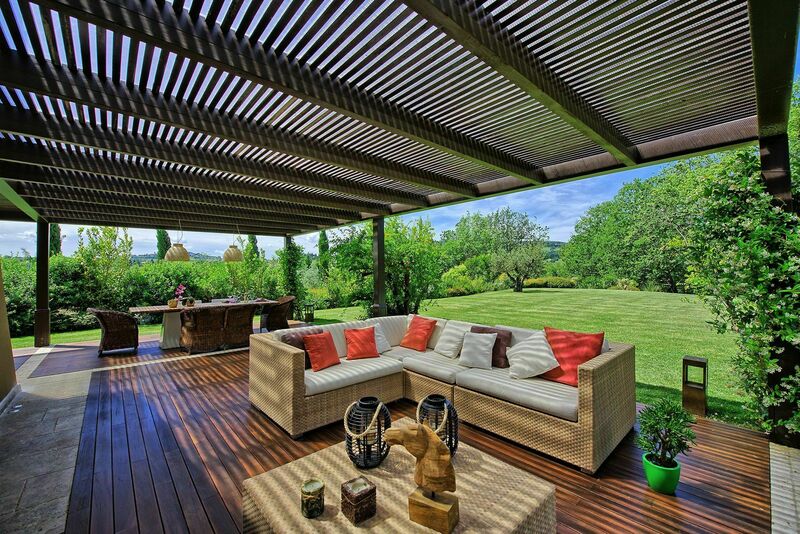 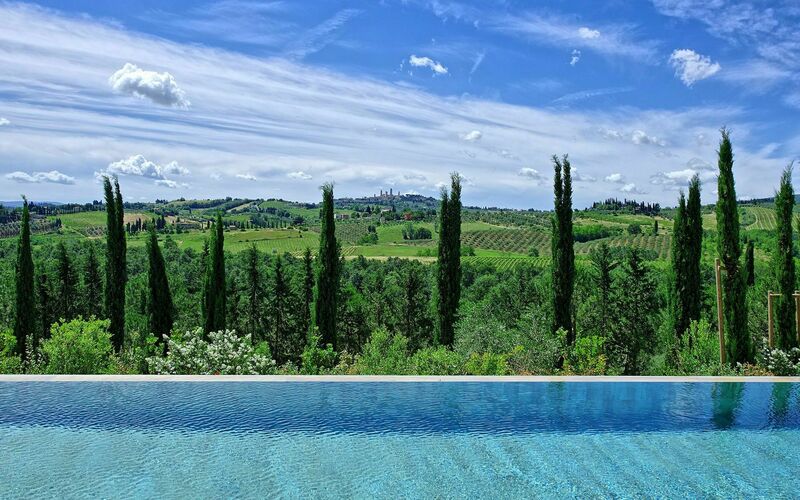 Beautiful luxury villa with private pool situated in San Gimignano area. 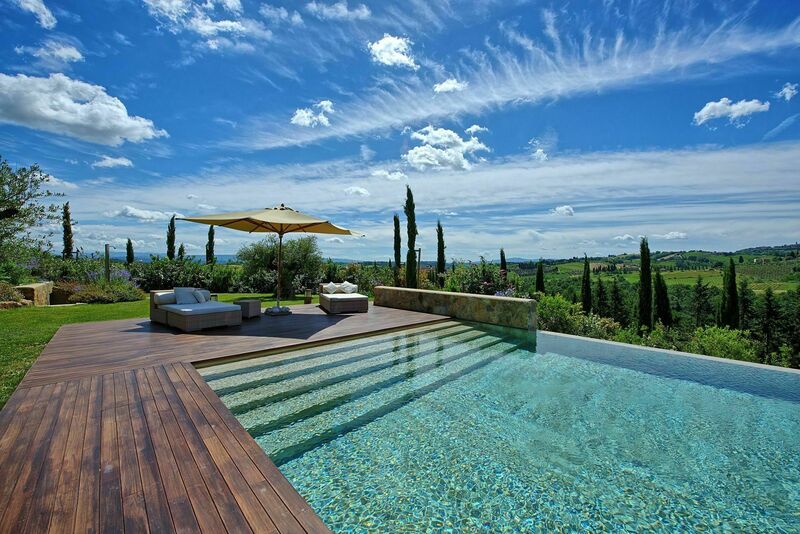 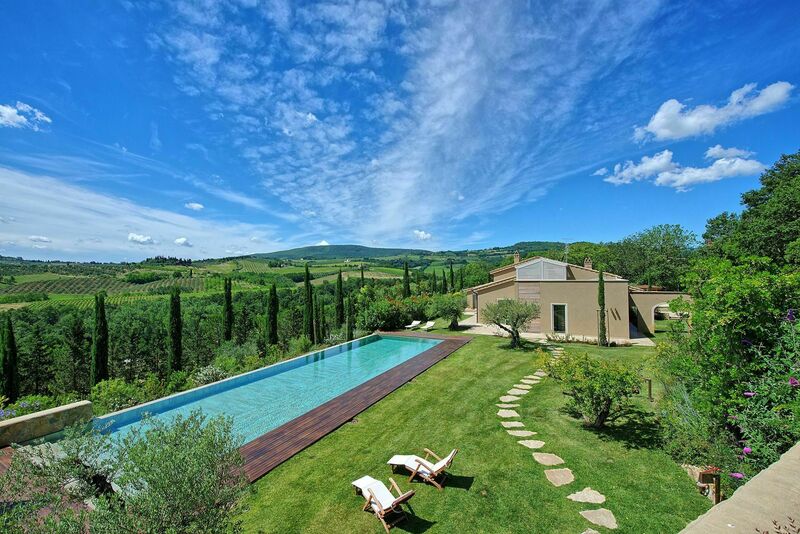 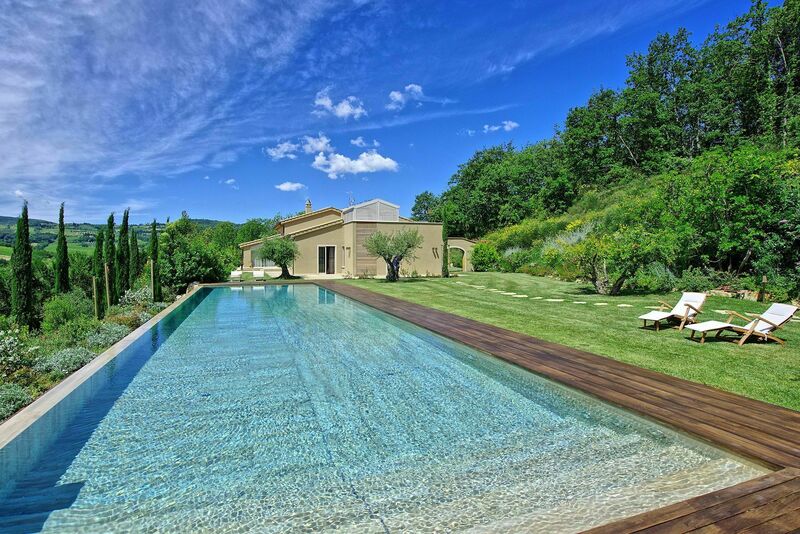 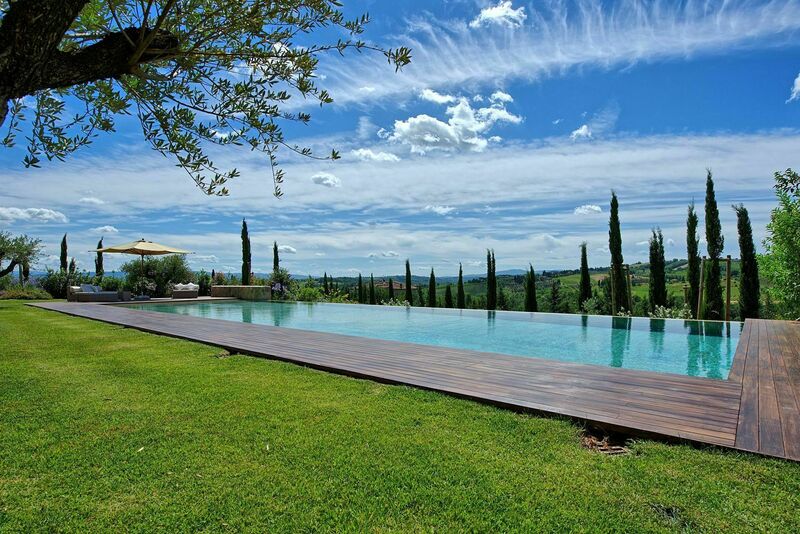 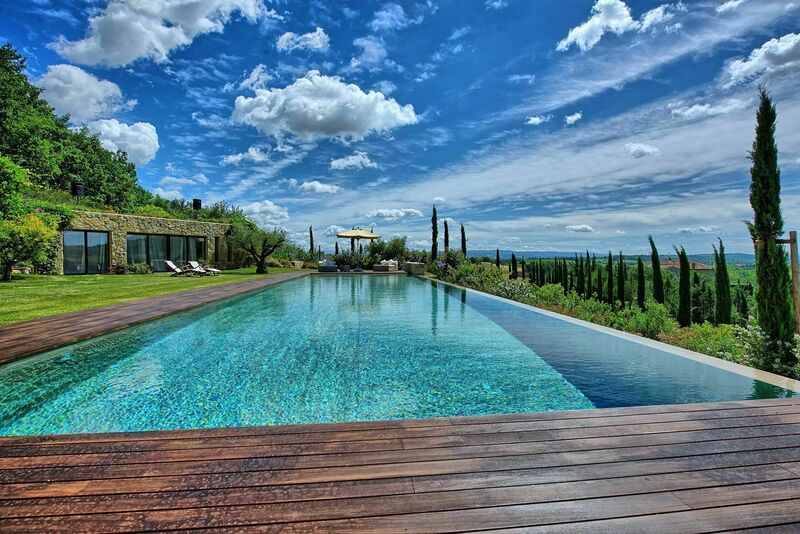 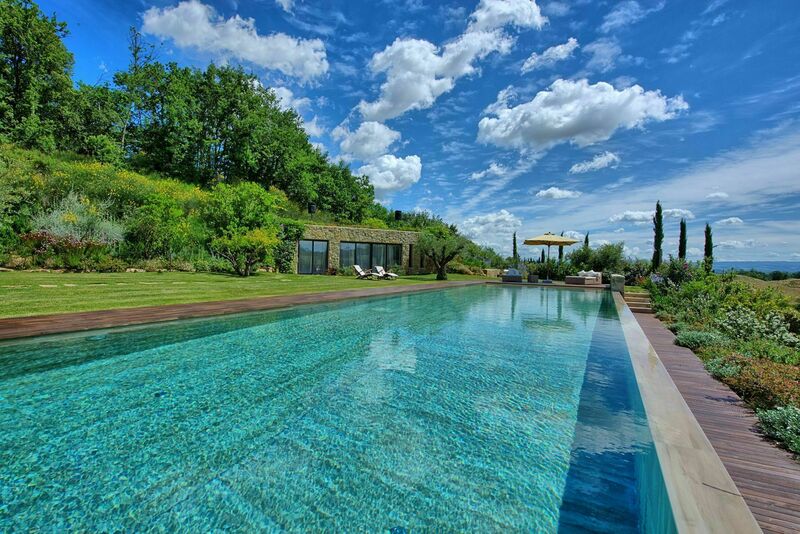 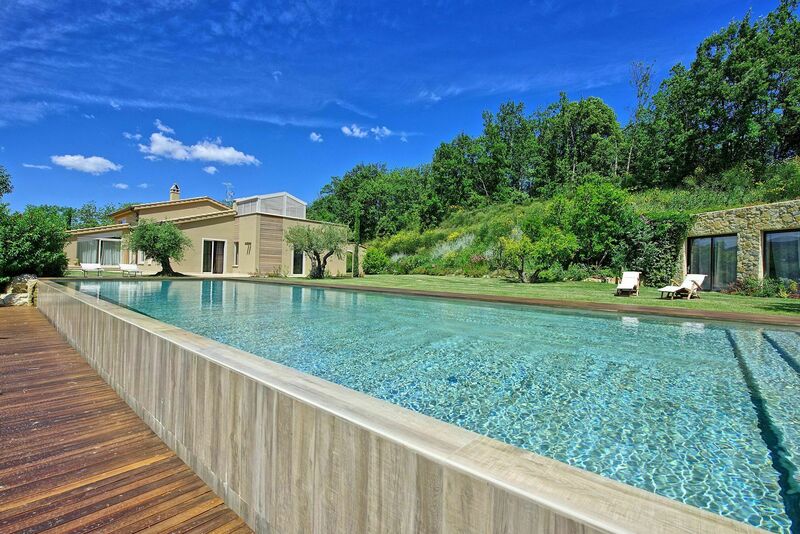 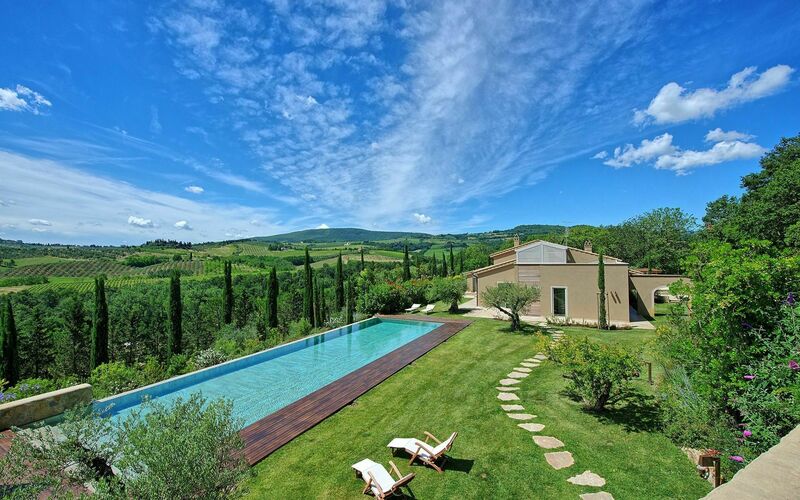 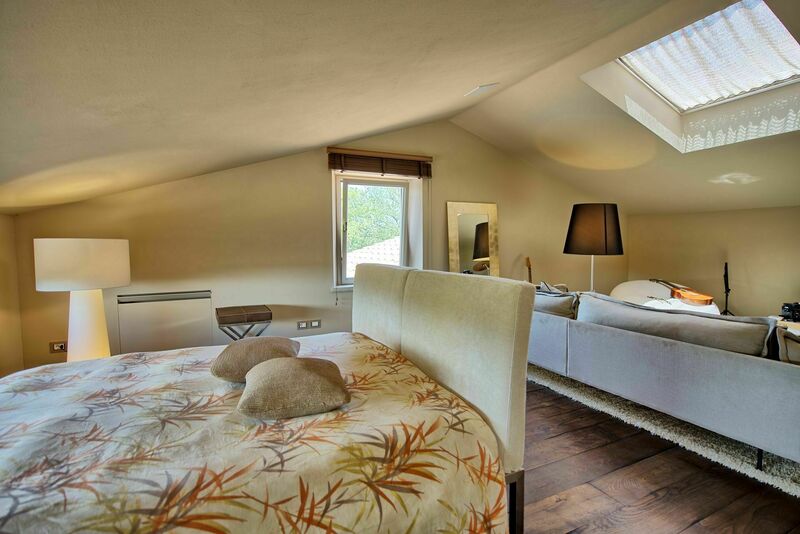 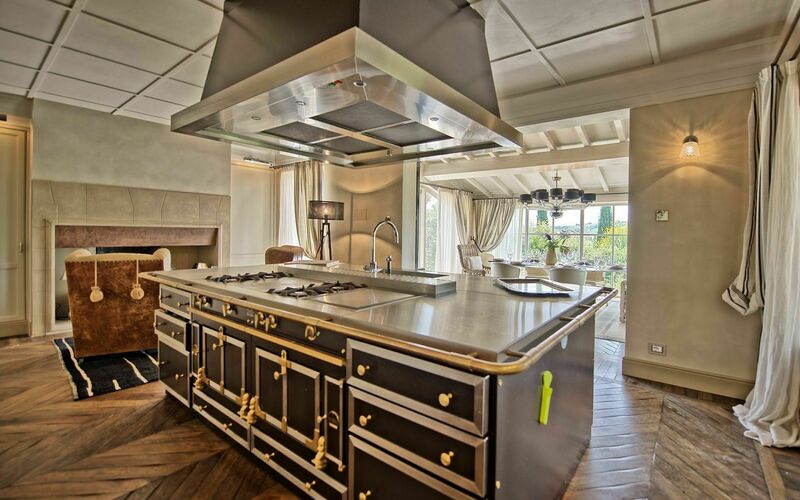 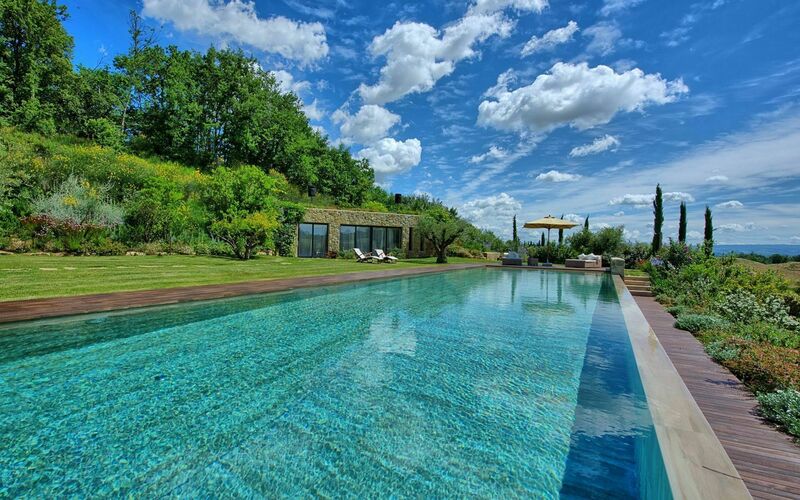 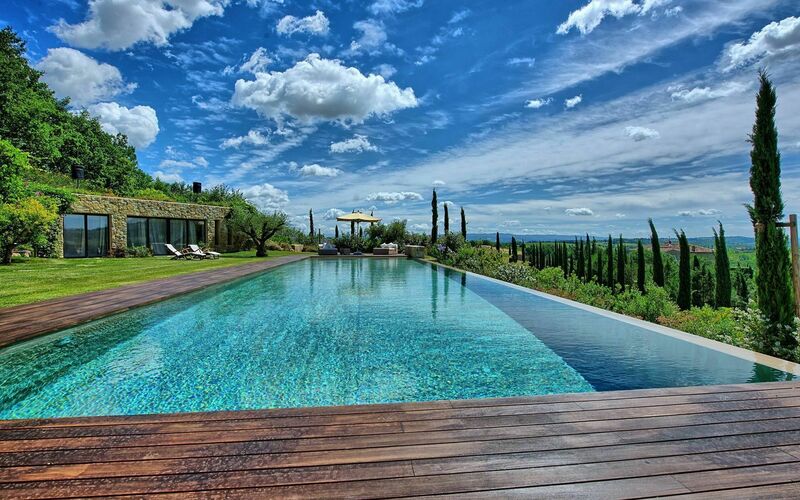 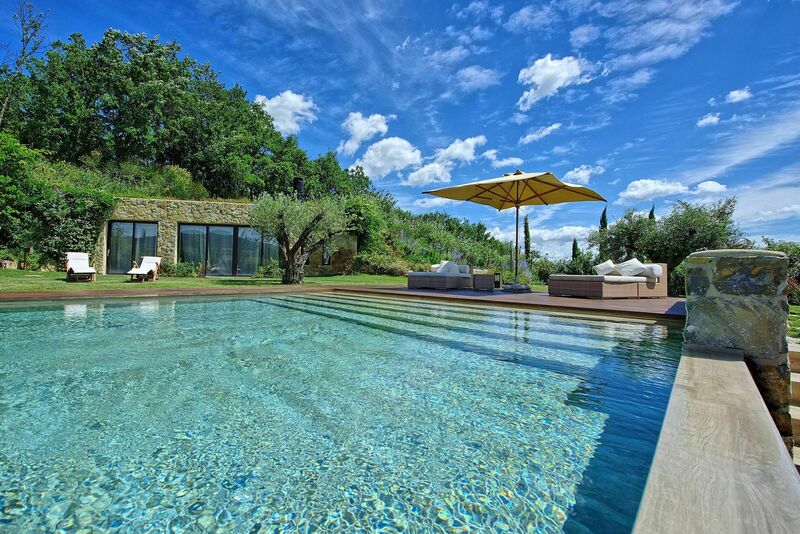 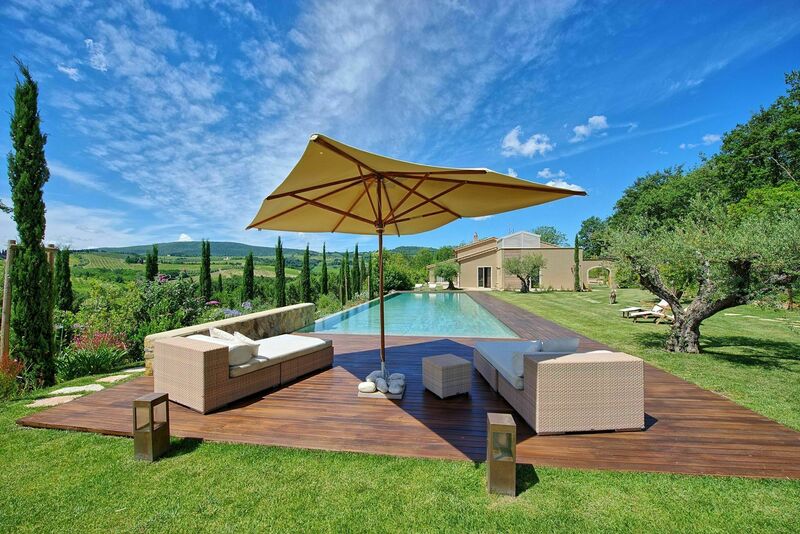 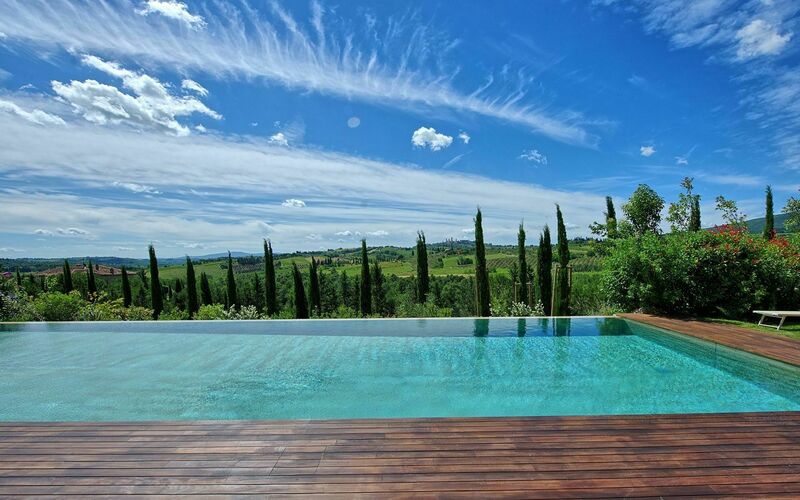 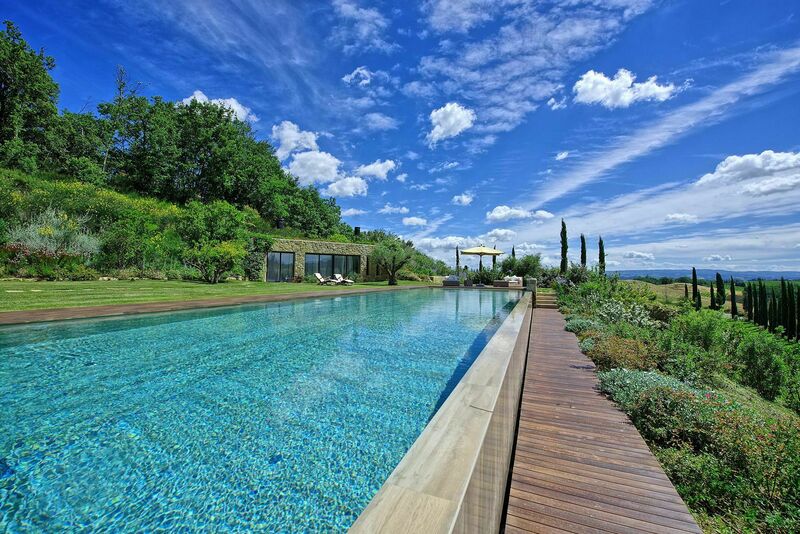 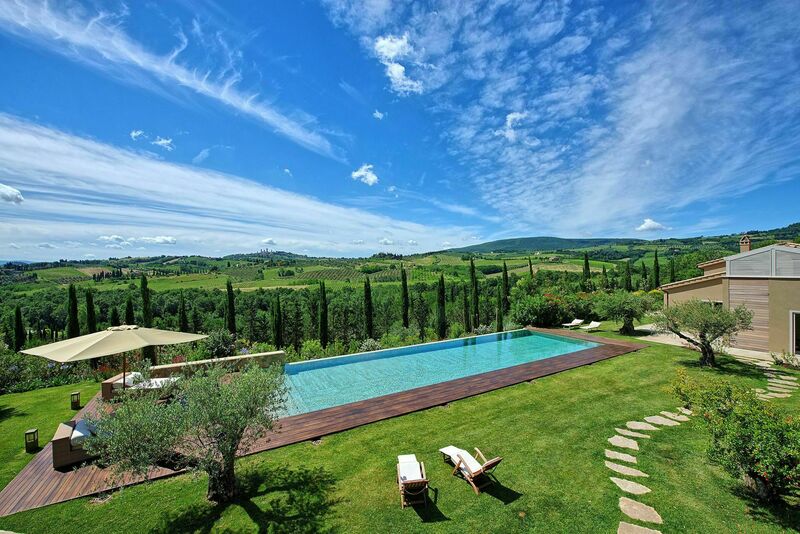 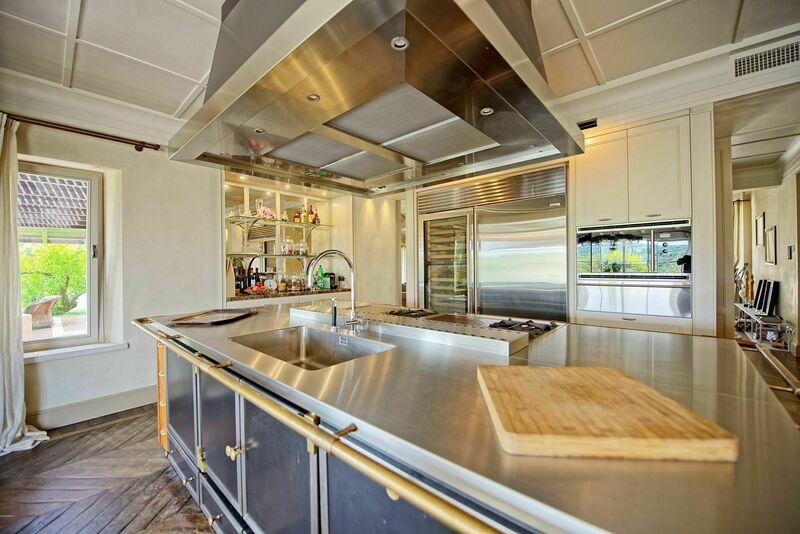 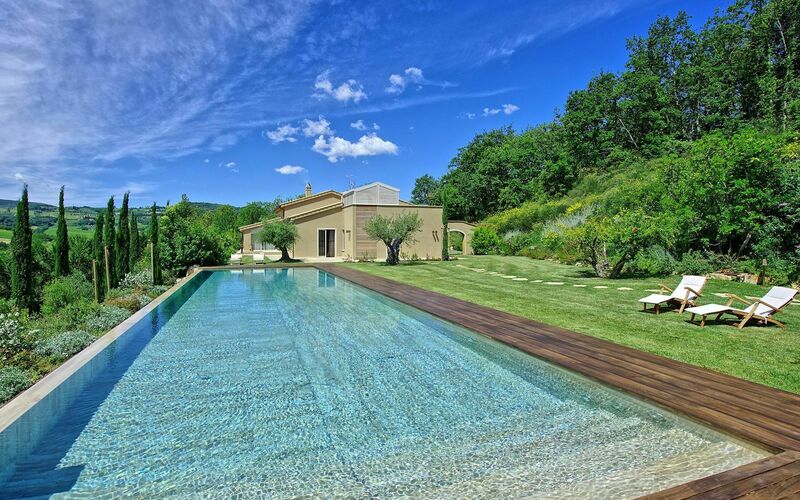 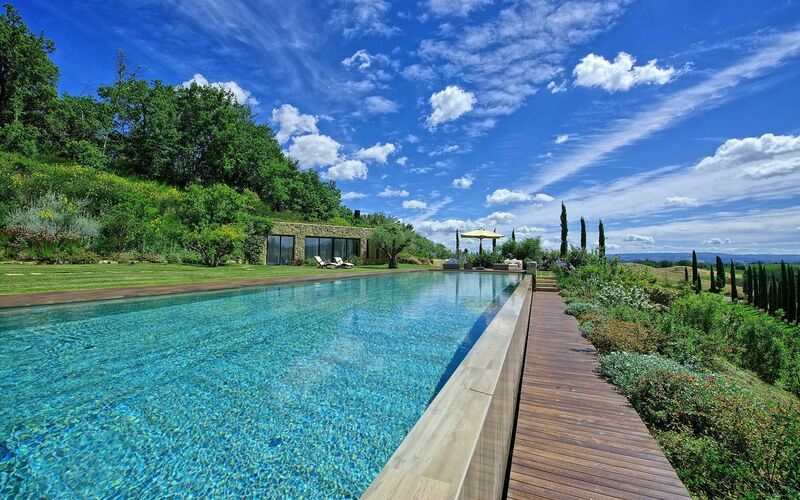 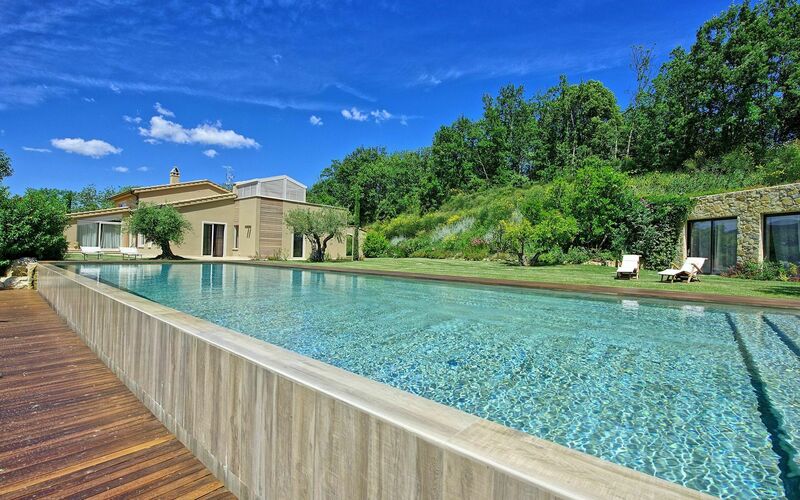 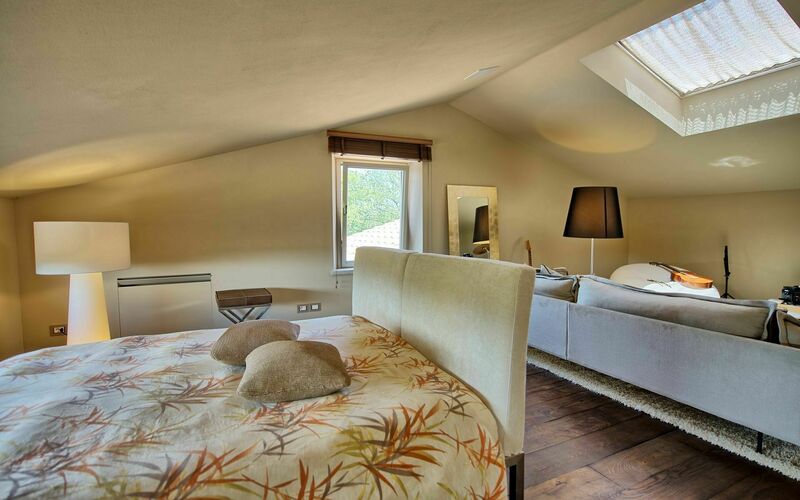 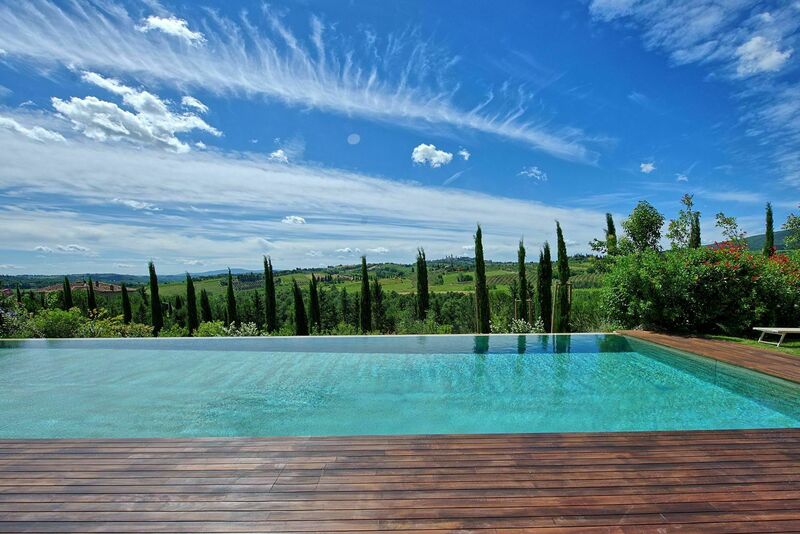 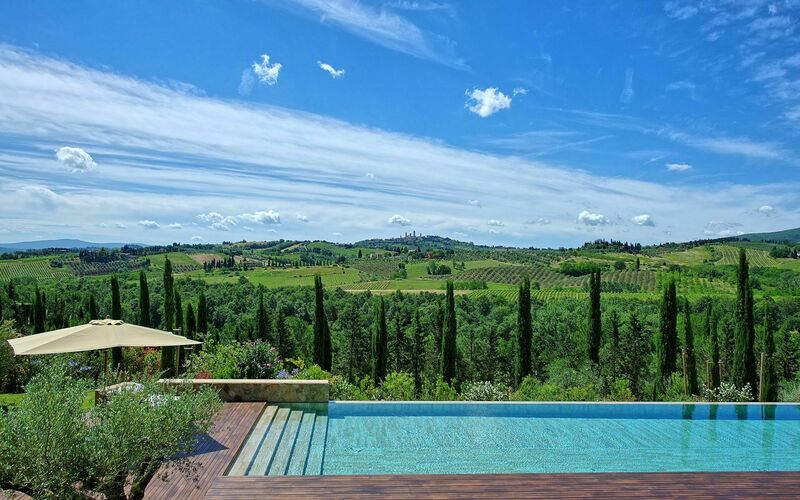 This stunning villa offers a private swimming pool and has amazint views over San Gimignano (which is just 5 km away). 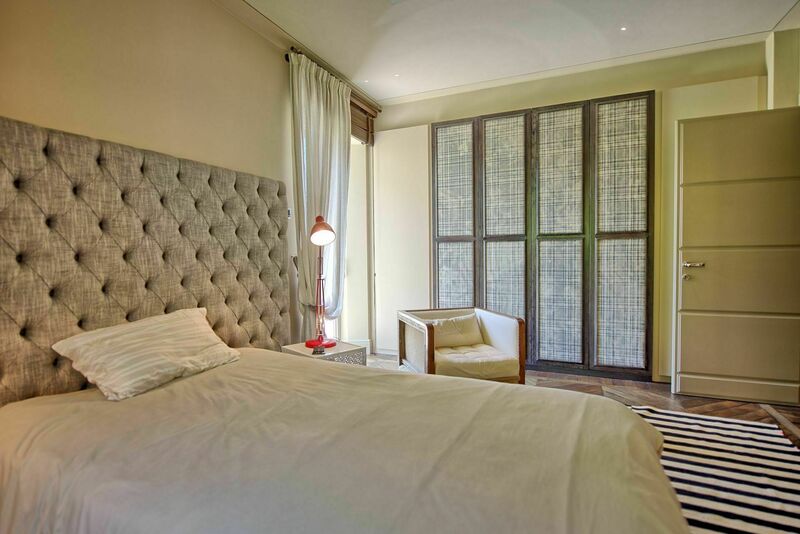 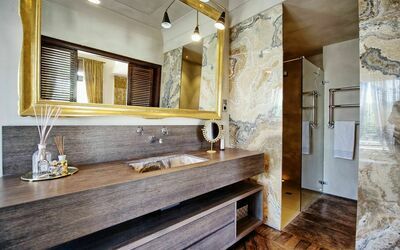 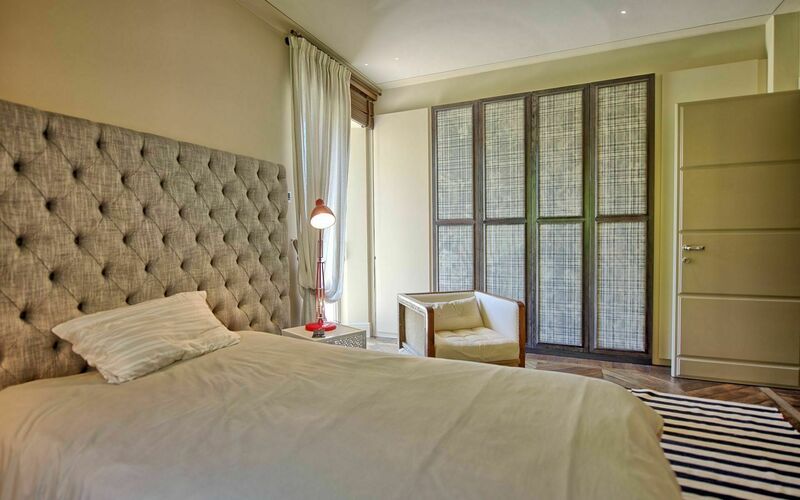 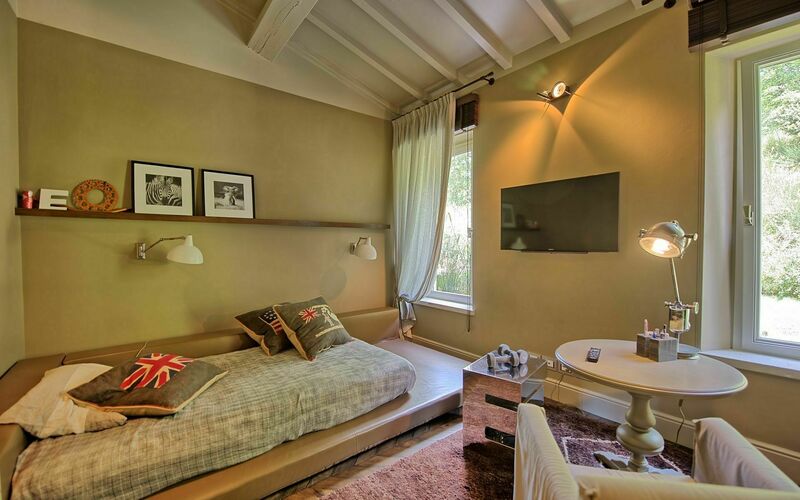 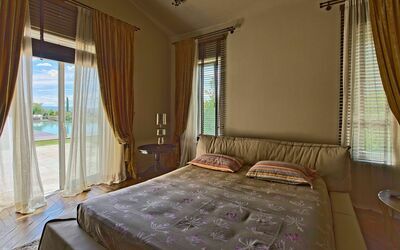 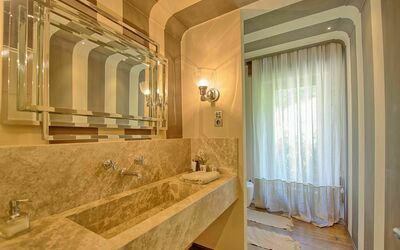 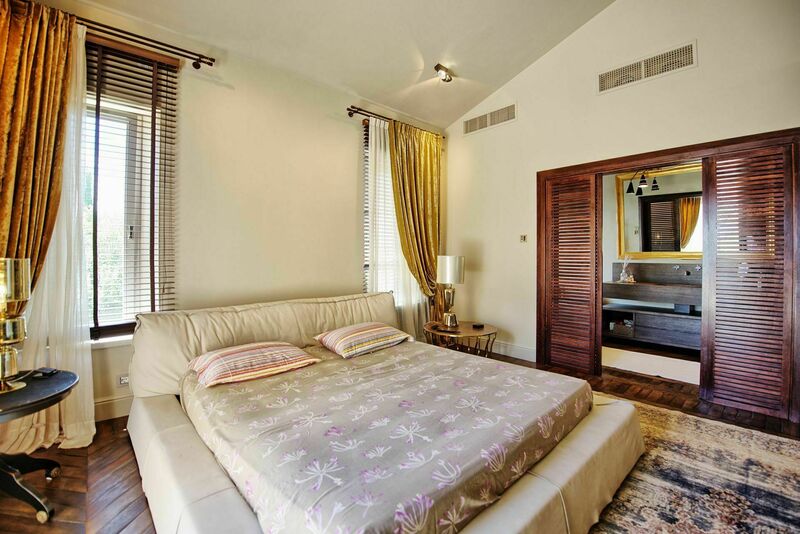 The villa is tastefully furnished and provides all comforts. 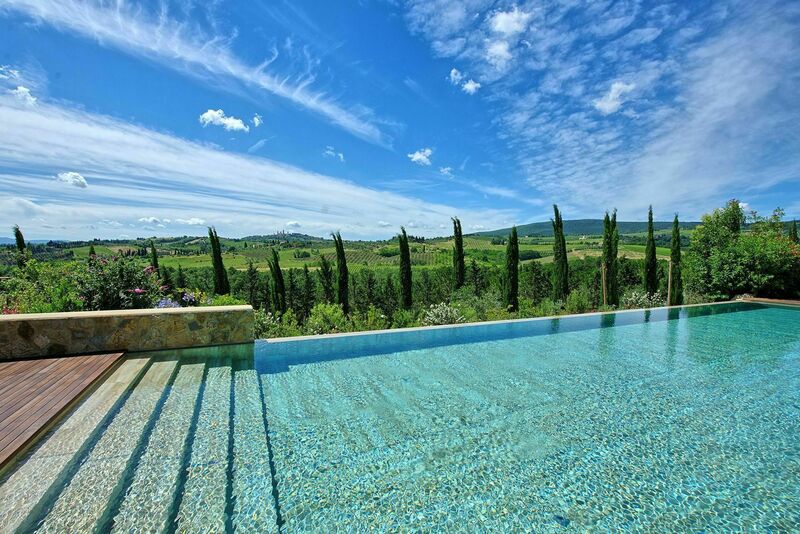 The views from the villa and the magnificent swimming pool are absolutely unbeatable. 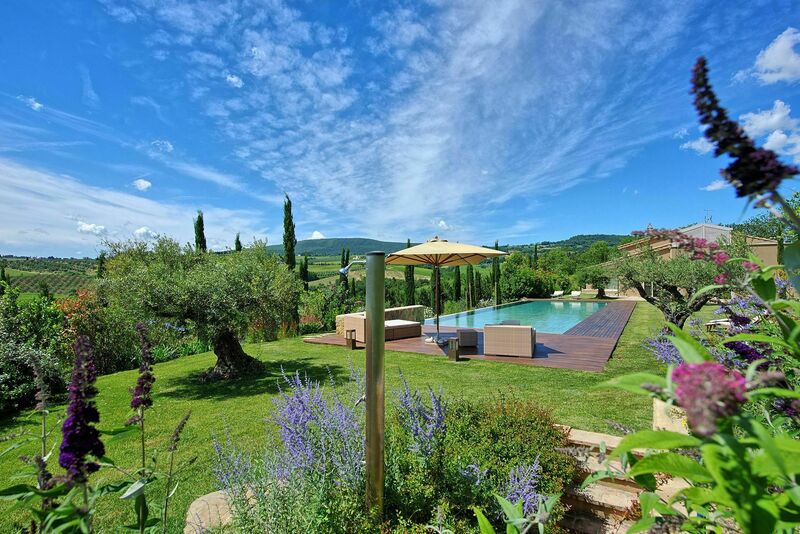 Outside guests can enjoy use of extensive gardens with flowers and shrubs. 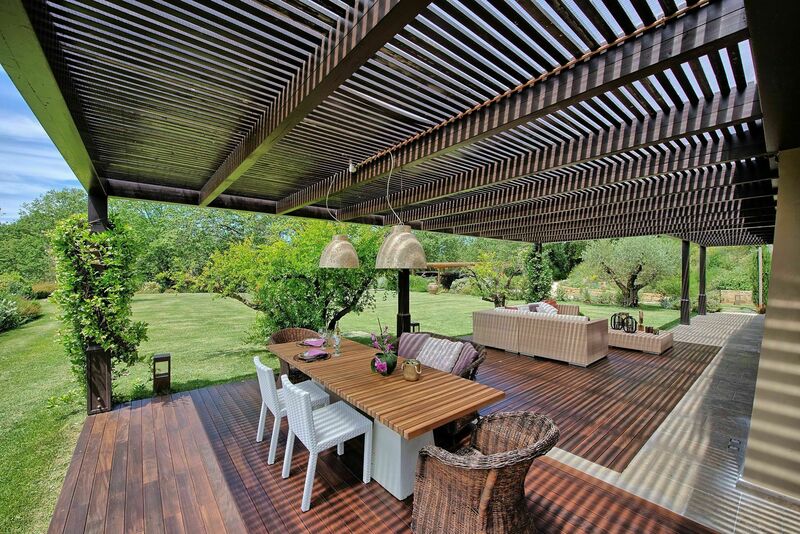 In addition there is a large covered area equipped with sofas, armchairs, table and chairs ideal for al-fresco dining. 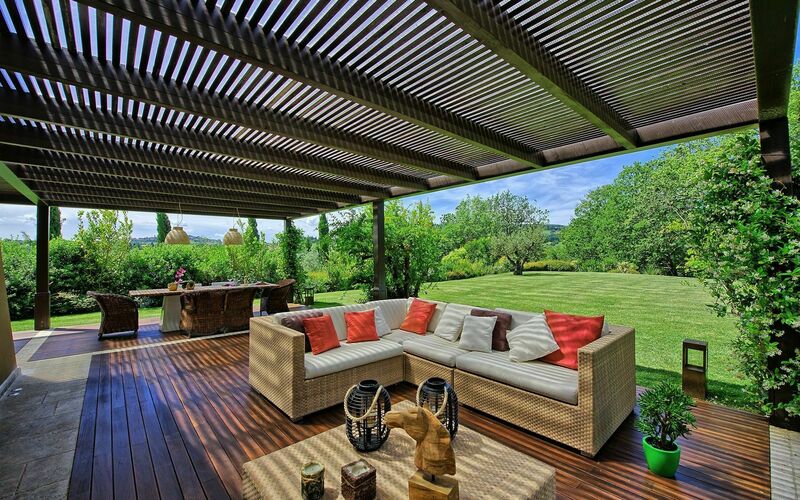 This area is accessed via wide patio doors and is surrounded by perfectly kept gardens. 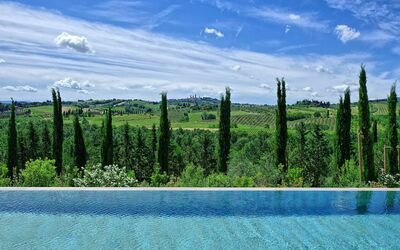 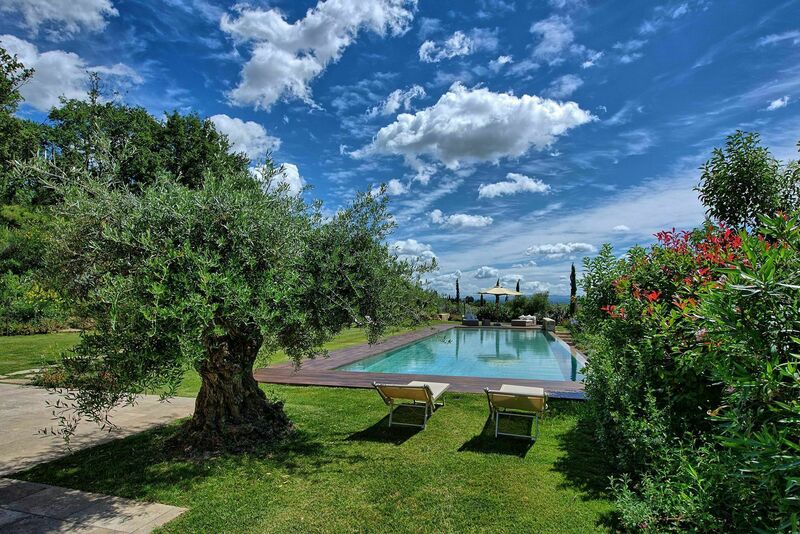 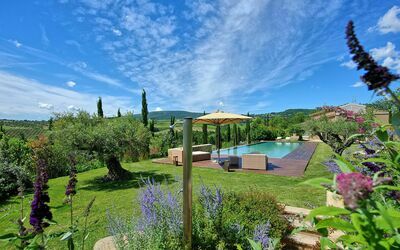 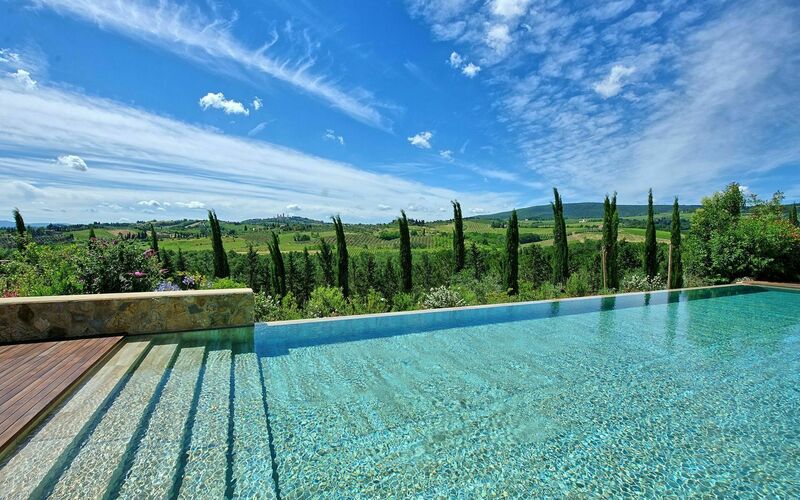 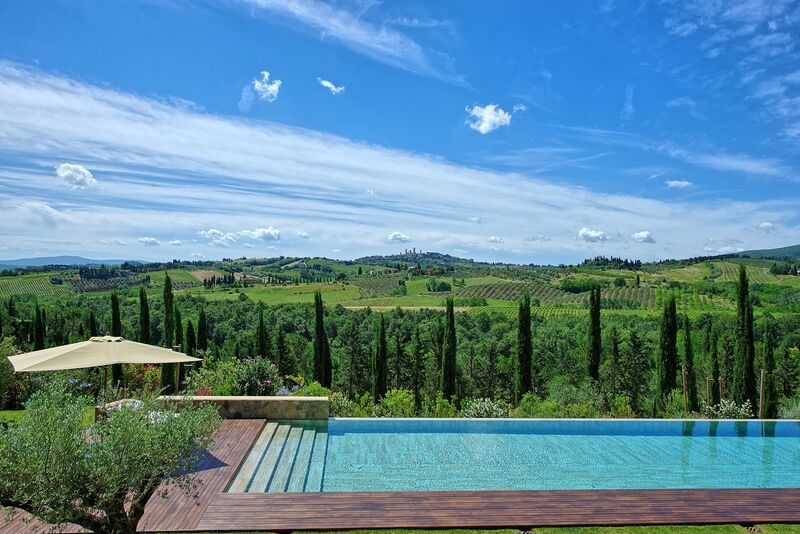 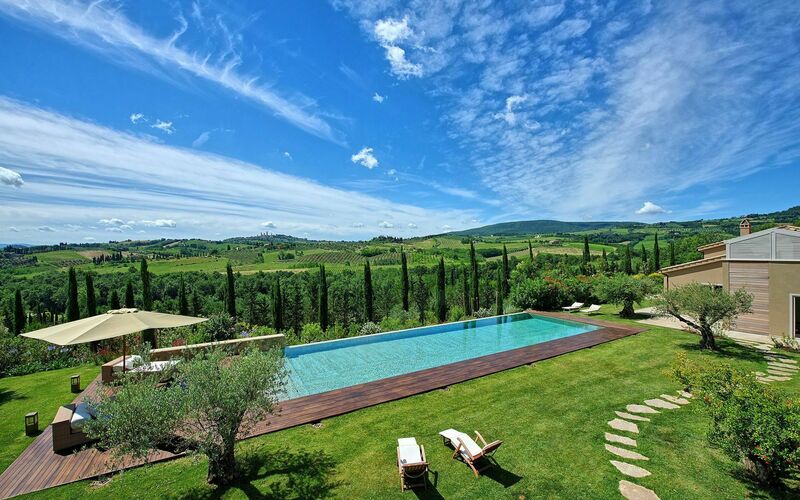 The private swimming pool is surrounded by a beautiful well-rgoomed lawn and offers amazing views over the surrounding hills and the towers of San Gimignano in the distance. 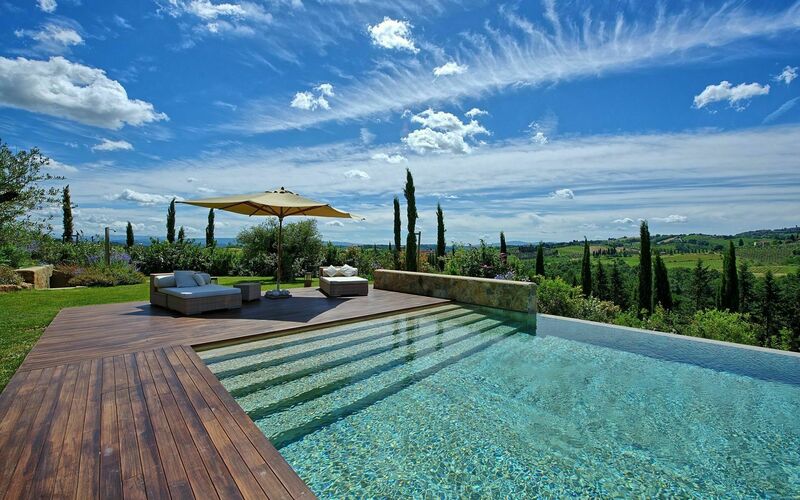 Sunbathing areas are available all around the pool. 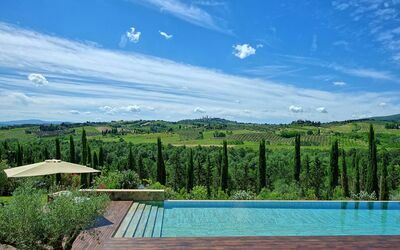 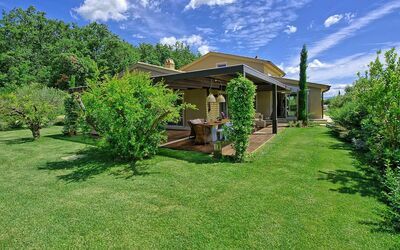 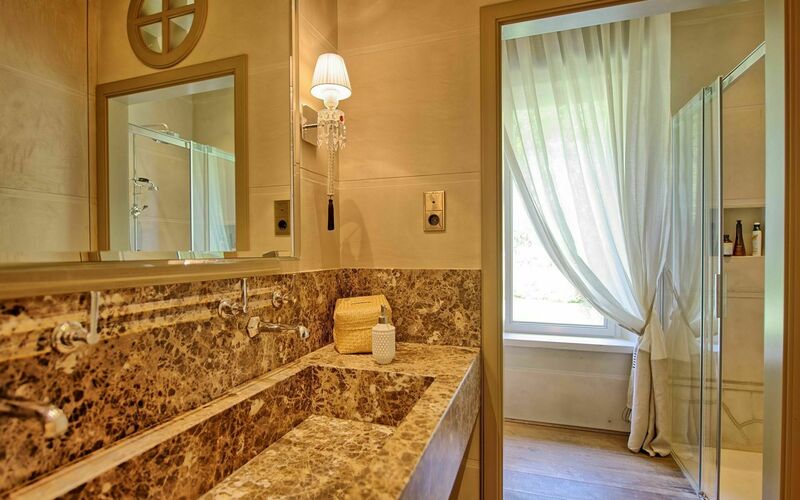 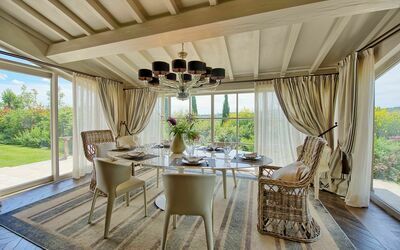 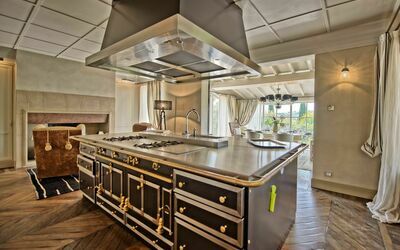 Villa Dora is perfectly located in the heart of Tuscany, within easy reach of San Gimignano, Volterrra, Certaldo, Siena, Florence, Lucca, Pisa, Orcia Valley, Maremma. 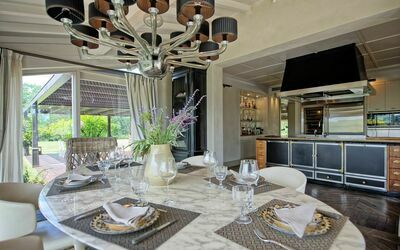 At guests' disposal:: private gardens, beautiful, private swimming pool with panoramic views (20m x 6m - min. depth 1,2 m - max. 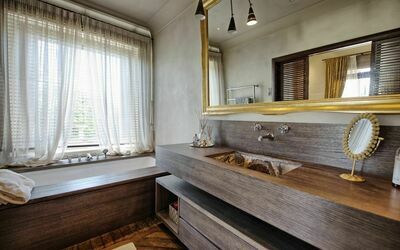 depth 1,9 m), gym and wellness area with sauna, turkish bath, 2 chromotherapy showers, WC, laundry room with washing machine and dryer, large furnished veranda, barbecue. The villa provides free wi-fi internet and air conditioning in all the rooms. Included in the rental price: mid-week maid service (3 hours) and change of towels. Distances: San Gimignano (shops of any kind) 5 km away, Certaldo 10 km away, Poggibonsi 15 km away, Volterra 33 km away, Siena 45 km away, Chianti Classico (with the towns of Castellina, Greve, Panzano, Gaiole etc...) is within 40 - 80 km away, Pisa 80 km away, Lucca 95 km away, Orcia Valley (Pienza, Montepulciano, Bagno Vignoni, Montalcino ecc...) 100 km away, Arezzo 120 km away, Cortona 135 km away. Ground floor: hall, large and airy lounge with fireplace (non working), satellite TV (65 inches) and dining area with direct access to the outside (provided with a shaded area equipped with sofas, tables and chairs), fully-equipped kitchen (2 ovens, microwave, food warmer, dishwasher, wine cellar, fridge with freezer, espresso coffee machine, orange squeezer), dining area with panoramic windows to enjoy the views over San Gimignano, WC, bedroom with french-bed, bathroom with shower, double bedroom, double bedeoom with direct access to the garden and en-suite bathroom with shower as well as hydromassage bath. First floor: double bedroom with en-suite bathroom with shower. 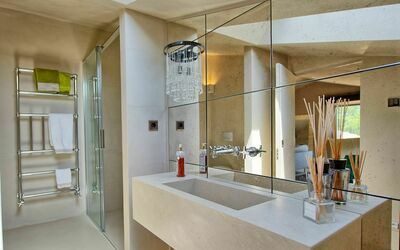 Poolside outbuilding: laundry room (washing machine and dryer), gym with wellness area (sauna, hammam, shower, WC).